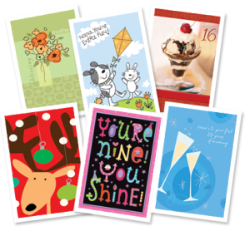 Hallmark Card Rewards Program = FREE Rewards! As much as I love receiving stuff in my mailbox, I also love this time of year because I get to send holiday cards to all my family and friends. And starting today, you can get rewarded for any Hallmark cards you buy at more than 40,0000 grocery and drug stores and super centers with the free Hallmark Card Rewards program. So here’s how it works: For every 5 Hallmark cards you buy, you earn a reward that you can redeem for gift cards and discounts for some really awesome partners Hallmark has teamed up with including Applebee’s and Omaha Steaks. Some of my favorite brands including Starbucks and Nike are set to go live on 10/1. 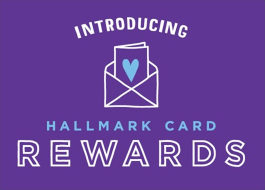 To start earning your rewards, sign up then download the Hallmark Card Rewards mobile app (Android and iPhone) to easily scan the barcode on the back of your card. If you don’t have smartphone, you can report your purchases online by entering the UPC. Simple, right?! I know I’m going to need to buy quite few cards very soon and with the holidays fast approaching, this would be the best time to join. We should also be seeing some awesome Hallmark coupons pop up online and inside select magazines (but don’t worry I’ll let you know when and where). After you sign up, click on *Member-Only Offers* in the blue toolbar to print a coupon for $5 off a $10 purchase. This should definitely help speed up the reward process for all of us! To kick things off, all you gotta do is sign up for Hallmark Card Rewards. It’s totally free! Plus the first 100 to sign-up will receive a FREE Hallmark Card Pack to get their rewards started AND be entered to win a $500 prize. This post is sponsored by Hallmark. All opinions are 100% my own. Read the Office Sweepstakes Rules here. Hey there! I actually haven’t sent one out in about 4 days. It’s been a little slow with hot offers lately. Don’t worry, you’re still signed up! Check back with me later this week! I see you keep posting this and i knew something was up. I finally saw at the bottom of the post that it is sponsored by Hallmark, no wonder why you keep pushing this.